Published in: The Microscope, 17 (4): 271-276, 1969.
l=3 (0.5c) µm [where c = maximum circumference of the erythrocyte = 42 µm] =63 µm. The enmeshment of erythrocytes as described traditionally (the network . . . entrapped and retracted around the RBCs6), cannot operate with such small allocations of fibrin available per erythrocyte Thus Zweifach (7) and others have spoken of a gelatinous exudate arresting the erythrocytes, although its nature was obscure; more recent research has revealed that the erythrocytes are arrested in the manner of a balloon on a string, each suspended cell - penderocyte = literally suspended cell (9) - being attached to an ultramicroscopic microfibril. Blood coagulation is often studied in static in vitro specimens1. Haemostasis is, by definition, a dynamic phenomenon and can therefore be studied only in flowing-blood preparations. Other workers (12) have described slide-chamber and ring-circuit apparatus which is useful where conditions of high-velocity flow are obligatory. In th present work, research into the problems of studying flow in pseudo-capillaries, utilising a single drop of blood, has enabled us to derive a satisfactory technique which dispenses altogether witt elaborate apparatus and greatly simplifies the speed and repeatability of the investigations. The technique now used relies on the capillarity exerted between a glass slide and a fine coverslip which produces centrifugal radial flow through fine capillary-like tubules formed in peripheral ring of partly-dried blood. Drops of fresh blood are placed on conventional slides and are allowed to stand for several minutes At the end of this time the addition of a fine coverslip induces haemostatic pressure which leads to the breakdown of the peripheral layer of partly dried, jelly-like blood. Fine undulating tubules form and in these blood flow may be observed with ease and rapidity. At presen we find a waiting period of 7 minutes is optimum for the observation described; the procedure is very much simpler than those we have employed earlier and is immediately adaptable to the concept of penderocyte test, by which the presence or absence of these cells may be observed rapidly from a sample of finger-prick blood. (b) the amount of crenation observed is negligible in any preparation and in 60% it is nil. The drawtube, extended to 180 mm throughout the experiments, was fitted with baffles to exclude fogging by extraneous light scattered from the specimen which was illuminated by a 750W forcibly cooled projector lamp unit. The unit was screened to give a blue-predominant spectrum (since visualisation at this extreme magnification is a function of the illuminating wavelength) and also to reduce nfrared which would otherwise unduly heat the specimen. Thermocouple sensors indicated that the specimens were maintained at or near 37C. The use of 15x and l0x eyepiece attachments enabled a final magnification to be attained in the region of 5000x with remarkably little emptiness, an extremely gratifying result. Figure 1. Light-ground appearance of the penderocytes; they are seen as 'pear-shaped' erythrocytes, their apices pointing upstream. 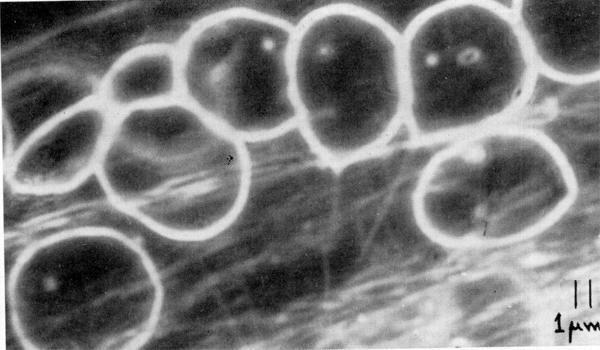 Erythrocytes may be seen within these haemodynamic tubules. They flow through the passages easily. Occasional examples will be observed to lie in the flowing blood with their apices (see Figure 1) pointing upstream; these are the penderocytes and they steadily increase in number as coagulation proceeds (in 7-minute specimens coagulation is already evident). Their superficial appearance is similar to that of erythrocytes entrapped in a gelatinous exudate; however, they may be observed to undergo lateral displacement when jostled by flowing erythrocytes, and thus describe an arc about the length of the suspending thread; and their position and the configuration of the pointed apex varies with the speed of flow and thus as the elastic thread undergoes changes in length. Irrigation of the preparation allows the reversal of flow to be induced, which unequivocally demonstrates the presence of fine threads anchoring the erythrocytes in position. During normal procedures the technique enables flowing blood to be observed at length, and the entire processes of occlusion and haemostasis due to the blood elements may be observed. For detailed studies (9) oil-immersion dark-ground microscopy has been utilised, which has demonstrated the presence of the threads by direct observation (11). They are of extreme fineness, of the order of 0.2 µm, and thus are markedly more tenuous than those of the normal threads of fibrin observed within coagulating blood. The dark-ground apparatus was adjusted optically to give a working numerical aperture of exactly 1.0 in order to derive maximum theoretical benefits from the technique. Figure 2. Dark-ground micrograph showing the suspensor microfibrils anchoring the erythrocytes within the fibrinous coagulum in vitro. The work of Bull (12) describes some aspects of the relationship between fibrin precipitation and the occurence of fragmented red blood cells in microangiopathic haemolytic anaemia, although they do not refer to an interesting if superficial study of similar erythrocytes by Bell13. The paper by Bull et al shows red-cell fragments attached to fibrin strands although there is no unequivocal evidence to confirm this postulate. 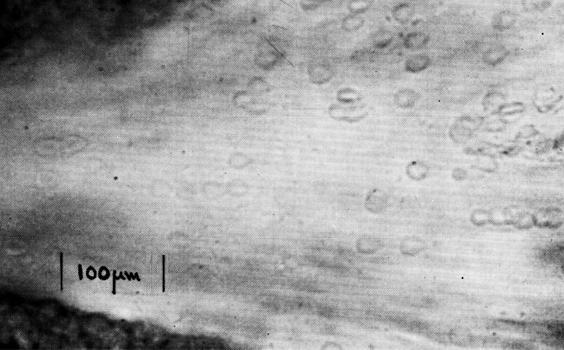 In order to ascertain whether the microfibrils observed in the present study were composed of fibrin, coverslips were specially prepared by drilling apertures in them, approximately 0.5 mm in diameter and irrigating through this saline containing the fibrinolytic enzyme plasmin (Kabi). The cells were observed to detach and to float downstream in familiar erythrocytic outline. Controls irrigated with saline or with serum remained with the anchoring microfibrils intact. Microchemical analysis of the fibrils is impracticable in view of their fine structure; only dark-ground microscopy enables them to be visualised, though not resolved, by reflected light (8) and such tenuous structures cannot therefore be conventionally analysed. However the action of plasmin tends to confirm that they are composed of fibrin. In over 100 samples of normal blood examined by this and earlier techniques, penderocyte formation has been observed within 6-8 minutes from the commencement of the procedure, i.e. at the moment of obtaining the blood sample (whether by finger-prick or intravenously). The number of cells is at first small but as time proceeds the proportion increases until the lumen of the tubule through which the blood is flowing becomes entirely occluded by masses of adjacent penderocytes. It is clear that a mechanism of this sort must obtain in normal haemostasis, since: firstly, a spongy, porous plasma clot alone is not an effectively fluid-tight plug and secondly, it is only by the suspension of cells in the manner of balloons that an open channel filled with flowing blood can be blocked. Normally blood commences to coagulate in contact with the trauma site itself, by which time the blood has already been expressed from the wound and therefore the precipitation of fibrin within it is of no avail. Platelet-plug formation clearly cannot apply to blood loss from vessels much larger than capillaries. The observations and films that have been made during the present series of investigations demonstrates the mechanical significance of the processes with great clarity. Suspended erythrocytes (termed in this research penderocytes) may be observed (10) by a simple, repeatable technique which demonstrates the dynamic aspects of the haemostatic mechanism in flowing blood. Critical dark-ground microscopy at very high magnifications reveals that the cells are held by ultra-fine fibrils which specific-enzyme tests suggest to be composed of fibrin. I would like to acknowledge the assistance of Dr. W. Shang Ng, Senior Registrar, United Cardiff Hospitals, for his help and advice; Dr. Roger Seal, Pathologist, Sully Hospital, for the use of facilities during part of this work; Messrs. Kabi Pharmaceuticals for a generous supply of plasmin (Kabi), and Mrs. Lynn McCarthy for secretarial assistance. 1: Biggs, R. and MacFarlane, R. G., (1962). Human Blood Coagulation and its disorders. Blackwell, Oxon. 2: Hardisty, R. M. and Ingram, G. 1., (1965). Bleeding Disorders. Blackwell, Oxon. 3: Spaet, T. H., (1966). Hoemostatic homeostasis. Blood, XXVIII 1 112-123. 4: MacFarlane, R. G., (1939). A simple method of measuring clot retraction. Lancet, 1 1199. 5: Gaarder, A., Johnson, J. and Owren, P. A., (1961). Adenosine triphosphate in red cells as a factor in the adhesiveness of human blood platelets. Nature 192, 531. 6: Buckley, M., et al, (1965). Ultrastructure of platelets and fibrin in the in vivo formation of the haemostatic plug. Blood, XXV, 4 604. 7: Zweifach, B. W., (1954). Sib Conference on Connective Tissues, Josiah Macey Jnr. Foundation, N. Y. 8: Ford, B. J., (1965a). The role of the erythrocyte in coagulation and haemostasis (British Microcirculation Society conference address). J. Roy. Micr. Soc., 84 1, 229. 9: Ford, B. J., (1965b). New observations on the role of the erythrocyte in coagulation and haemostasis. J. Roy. Micr. Soc., 84, 4 423-426. 10: Ford, B. J., (1968a). The concept of antipoint applied to submicroscopic fibrillar structures. Proc. Roy. Micr. Soc., 1, 3, 14-16. 11: Ford, B. J., (1968b). Micrographic study of penderocytes. International Yearbook of science and technology, McGraw Hill, N. Y.: 90. 12: Bull, B. S., Rubenberg, M. L., Dacie, J. V. and Brain, M. C., (1967). Red blood-cell fragmentation in microangiopathic haemolytic anaemia: in-vitro studies. Lancet 2 (7525), 1123-1 125. 13: Bell, R. E., (1963). The origin of burr erythrocytes. Brit. J. Haemat., IX, 4, 552-555. *Presented at INTER/MICRO-69, 9-11 September, 1969, Imperial College, London, England.